Eleanor Roosevelt became head of the UN's Commission on Human Rights in 1946. 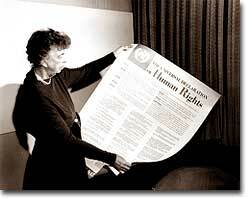 Here she holds a copy of the "Declaration of Human Rights," which she considered to be her greatest achievement. The Allies had won the war, but would they be able to keep the peace? An examination of the period between WWI and WWII showed a lack of commitment to the spirit of internationalism. The old League of Nations proved too weak in structure to fill this void. Perhaps a stronger international body, as envisioned by Woodrow Wilson, was necessary to keep the world powers from tearing each other apart. It was in this spirit that Franklin Roosevelt championed the creation of a United Nations. The Big Three of Churchill, Roosevelt, and Stalin had devoted hours of dialogue to the nature of a United Nations. After agreeing on the general principles at the Dumbarton Oaks and Yalta Conferences, delegates from around the world met in San Francisco to write a charter. With the nation still mourning the recent death of Franklin Roosevelt, his wife Eleanor addressed the delegates. Despite considerable enmity and conflicts of interest among the attending nations, a charter was ultimately approved by unanimous consent. Despite the ideological animosity spawned by the Cold War, a new spirit of globalism was born after WWII. It was based, in part, on the widespread recognition of the failures of isolationism. 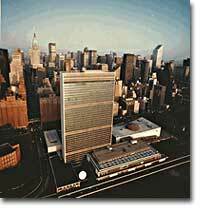 The incarnation of this global sprit came to life with the establishment of the United Nations in 1945 with its headquarters in New York City. The United Nations headquarters complex, consisting of four buildings, occupies 18 acres in New York City. The UN charter called for the establishment of a Security Council, or "upper house." The Security Council serves as the executive branch of the United Nations. The Security Council must authorize any actions, such as economic sanctions, the use of force, or the deployment of peacekeeping troops. Each of the "Great Powers" — the United States, Great Britain, France, China, and the Soviet Union — holds a permanent seat on the Security Council. The remaining ten seats are elected to two-year terms by the General Assembly. Each permanent member holds the power of veto. No action can go forth if any one of the five objects. As the Cold War crystallized, the countervailing veto powers of the United States and the Soviet Union served often to inhibit the Security Council from taking any forceful or meaningful action. The main body of the United Nations is called the General Assembly. Every member nation holds a seat in the General Assembly, which is often described as a town meeting for the world. The General Assembly has standing committees to address ongoing issues such as economics and finance, social, cultural and humanitarian concerns, and legal problems. The General Assembly passes resolutions and has the power to make recommendations to the Security Council, but has no power to require any action. In addition to the General Assembly, and Economic and Social Council has committees designed to address a wide array of topics from the Status of Women to the Environment. World leaders met at Dumbarton Oaks, Washington, D.C., in August 1944 to formulate plans for a new organization to promote international cooperation. The general principles established there provided the foundation for the United Nations charter. A Trusteeship Council was designed to oversee the transition of states from colonies to independent nations. The Secretariat manages the day-to-day operations of the United Nations. An International Court of Justice was also created. The UN can point to many solid accomplishments. Among them: sending peacekeepers to war-stricken areas, making recommendations on how to raise literacy and health rates in the Third World, and even authorizing the use of force against aggressor nations. In 1945 as well as today the UN gives cause for believe that nations can get along together. In a world with conflicting histories, agendas, and political posturing, one international group — the United Nations — remains above the day-to-day fray. When the Cold War ended in the 1990s, many citizens around the globe once again looked to the United Nations with renewed hope of building a safer, stronger planet. Who better to write about the United Nations than the UN itself? This website contains information on the organization, including the UN charter and the members of the General Assembly. Be sure to check out the biographies of the Secretaries-General. This brief webpage describes the high points in United Nations history since 1945. Though a little light on information, there are some good representative pictures of the organization and its missions. Take a moment to peruse the entire charter of the United Nations, drafted in San Francisco in 1945. The UN is still a controversial organization today, fifty years after its founding, with many of the provisions of the charter still being questioned. Part of the UN Charter, the International Court of Justice (ICJ) hears cases with international implications. The Court itself is located in Den Haag, Netherlands, and its roles are "to settle in accordance with international law the legal disputes submitted to it by States, and to give advisory opinions on legal questions referred to it by duly authorized international organs and agencies." Visit the official ICJ website with information on new cases and all past decisions. One of the most important parts of the United Nations, the Security Council has the maintenance of "international peace" as its main priority. This UN website has a brief description of the Security Council, and lists the country which holds the rotating presidency of the Council. The United States' share of the 1999 UN budget was $298 million. In contrast, the presence of the UN, its agencies, and its diplomatic corps in New York City generates over $1 billion per year for the City. The 1965 Nobel Peace Prize did not go to an individual but to an organization — the United Nations Children's Fund, UNICEF.